1. Combine the chicken bones and scraps in a stockpot with salt and water to cover by 1 inch. Bring to a boil, reduce heat and simmer for 30 minutes. Skim and scum that rises to the surface of the stock. 2. Add the flavoring ingredients to the stock and simmer, partly covered, 1-1/2 hours or more. Strain through a sieve into a bowl and discard the solids. Degrease the stock. 3. In the cleaned stockpot, melt 2 tablespoons butter over moderate heat, add the leeks and cook, stirring occasionally, for 10 minutes. Add the apples, peeled and cut into ½ inch pieces, the apple juice, the vinegar and the stock. Bring the mixture to a simmer, skimming off any fat or froth. Reserve stock. 4. 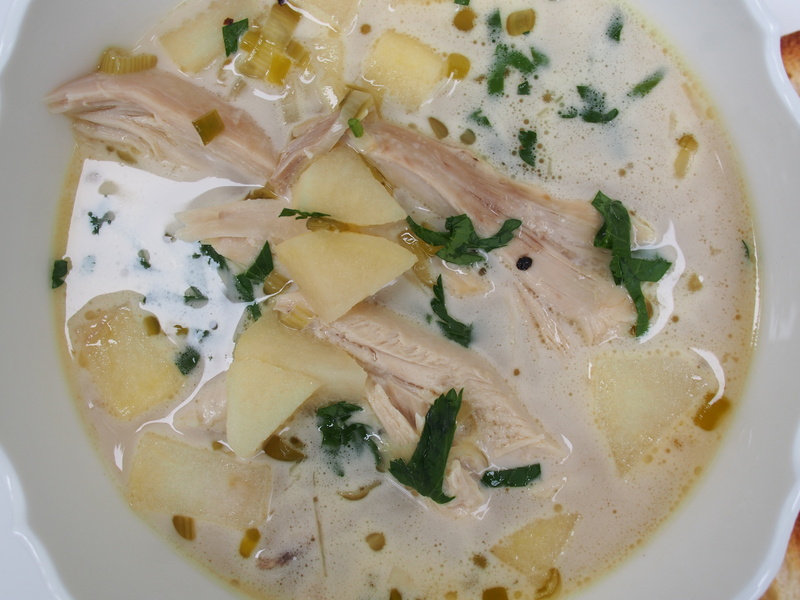 Skim the fat from the soup and stir in the Calvados, the cream, the shredded chicken and salt and pepper to taste. Simmer the soup for 3 minutes, until heated through and serve with the toasted bread. 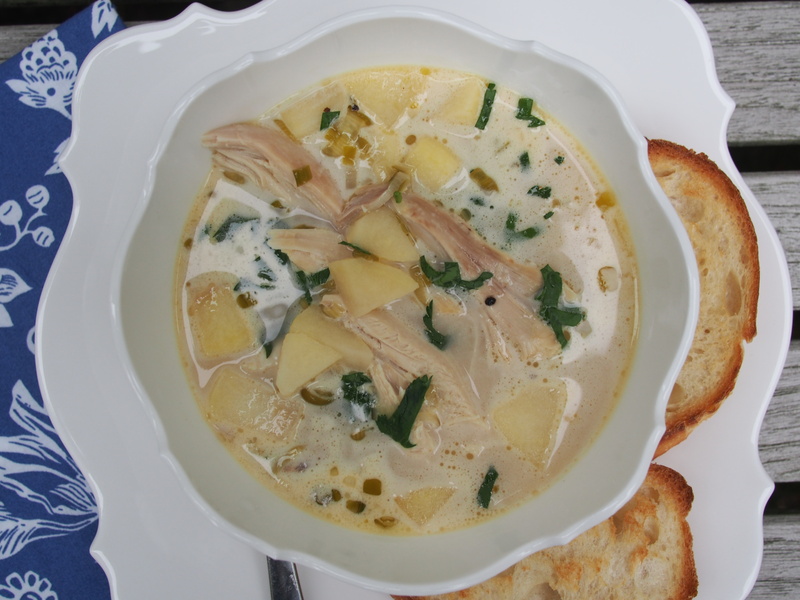 If you want to make the soup with an uncooked chicken: Rinse the uncooked bird under cold tap water, remove any excess fat and and any giblets stashed in the cavity, and place the chicken in a pot with 1 tablespoon salt and water to cover by 1 inch. Bring to a boil, reduce the heat to medium low and simmer, partly covered, for 30 minutes. Transfer the chicken from the pot to a plate (reserve the stock) and set it aside until it is cool enough to handle. Discard the skin, remove the meat from the bones and shred the meat. Once the meat has cooled completely, cover and refrigerate it until you’re ready to finish the soup. Return the bones to the pot and continue with the recipe at step 2. If your leftover chicken carcass doesn’t have enough meat on it to finish the soup: buy 2 pounds of boneless skinless chicken breasts from your grocery, salt them and add them to the degreased stock in step 2. Bring to a boil, reduce the heat to medium and poach the chicken until the juices run clear, about 20 minutes. Remove the chicken with a slotted spoon to a plate to cool, then shred it. Proceed with step 3.